H.C. Russell’s observational program was to last just over ten years, who formally started this project with the bright double star Acrux on 25th April 1871. This similarly replicates the commencement of John ’s southern hemisphere survey, that was underway on 22 February 1834. Herschel’s micrometric measures of double stars using a filar micrometer was to begin later on 2nd May 1834, when the setting-up of the observatory and equatorial telescope had been finally completed. First measures were of the bright binary system of α Centauri. Russell’s original instigation of this ambitious program was likely from direct correspondence of Sir John Herschel himself, who would have been very keen on finding any motion or changes from his collection of 2,102 discovered pairs. No doubt he was looking for another southern observer to confirm his discoveries. By coincidence, John Herschel died aged seventy-nine on 11th May 1871 – just two weeks before Russell had started his Sydney Observatory double program. 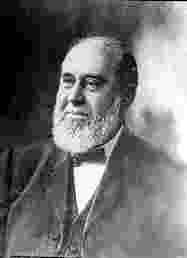 Due to the distance from Great Britain to Australia, Russell would have been unaware of Herschel’s passing, and would have learnt of the news sometime after late-June 1871. In hindsight, this now appears a suitable and fitting tribute. Even more of a coincidence, Herschel was in the middle of his four years of southern observations when Russell was born in New South Wales at Maitland, near Newcastle. Innes (1899) correctly says in his Introduction; pg. xiii. Also within this Sydney Observatory publication appears the first listing of “New Double Stars”. These were all the new discoveries that totalled 350 [Note 1] of then unknown double stars — now formally assigned as the Russell pairs or “R” in the current catalogues of double stars like the Washington Double Star Catalogue or WDS. Of these 350 systems, only seventy-five (21.4%) remain in the WDS. Innes (1899) lists only ninety-seven of importance (all under 20 arcsec.) with thirty-one being already pre-discoveries by other observers and another three being duplicates of other Russell pairs. This makes the total of just sixty-three or 18.0%. Russell’s listings did also include fourteen multiple stars — the brightest being R 127 (09354-4900) in Vela, and also the embedded double star in triple, R71 AB / SLR 22 BC (07144-4440). He discovered only another five pairs after 1882. As double star collection, they are mostly uninteresting and unimportant systems. The best among the discoveries is the bright binary star, β Muscae / R 207 (12463-6805). Innes (1899) [pg.283] points out there is three versions of this Sydney publication. “A valuable series of measures of known double stars (mostly from h. [John Herschel]) nearly all south of Dec. −34° made by Mr Russell and Mr L. Hargrave with refractors of 7¼ and 11½ inches, followed by a list of 350 new double stars. Unfortunately this work suffers much from misprints and other errors. In the observations of new double stars the name of the observer has not been recorded; here it has been assumed to be Mr Russell, except in one or two cases where there is no other evidence Mr. Hargrave was the observer. [1.] My main aim in reproducing the introduction chapter of this book is to allow the reader to gain some understand of the main Double Star programme, and explain the reasoning to why H.C. Russell undertook this extensive project, that spanned the years between 1870 and concluding by about 1897. [2.] John Herschel also extensively observed nebulae and clusters to total some 2,306 southern objects. [3.] Some often claim Russell discovered 500-odd pairs, with the additional systems contained in a second catalogue. Nearly every one is either two wide in separation or are too faint. None appear in the current WDS. [4.] Innes uses the original publication published by Sydney Observatory probably to avoid the discrepancies, though it seems likely that the RAS manuscript was later edited by Russell before submission. Although I have not thoroughly researched this aspect, there does remain some questions regarding Innes motivation here. Perhaps the time required to sort out the unnecessary ‘mess’ that three version had left behind, dissuaded Innes to investigate this further. THE study of Double Stars is, I think, one of the most fascinating which astronomy gives us. The great number and variety of the objects already known, and the certainty that many new ones will be the reward of any diligent search for them, keep up the interest to such an extent that the observer needs no other incentive to his work. M. Flammarion, after an examination of the observations already made — and be it remember that this branch of astronomy may be said to have been originated by Sir William Herschel, about the year 1800 — find that there are 11,000 double and multiple stars catalogued. Of these, 819 give certain indication of relative movement ; of which 731 are double, 73 triple, 12 quadruples, 2 quintuples, 1 sextuple ; of these again, 518 seem to form orbital systems, and 316 are only united by celestial perspective. Observation further shows that the components of an orbital system may be separated by as much as 22″, and two stars separated by 15′ of arc may have a common proper motion. Again, Mr. Doberck, after a critical examination of double stars, considers that only the orbits of twenty-seven are known, and only seven are in the Southern Hemisphere. We know five stars whose period is under fifty years ; seven with periods of 50 to 100 years ; six between 100 and 200 years ; six between 200 and 350 years ; three over 400 years. 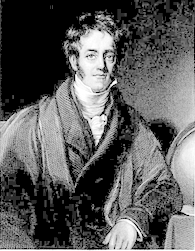 If, in addition to these statistics, we bear in mind that the Southern Hemisphere is only partly explored, and that in the Northern Hemisphere, which has been examined over and over again with fine instruments, used by such observers as Sir William Herschel, Struve, and others, it has been recently shown that it is possible, with moderate or small telescopes and good eyes, to find many new and difficult objects, as Mr. Burnham has done, I think you will see there is justification for the opinion which I have just expressed, and that the observer, in watching for these changes, and then in the investigation of them to see whether they are due to the motion of one star around the other, to independent motions of the stars, or the annual motion of the earth, has his interest constantly maintained [l] and it is not lessened by the fact that he may go on thus for years making  observations which seem to prove that there is orbital motion, only to find in the end that the changes he sees are due independent motion, as I endeavoured to show you last year in reference to p Eridani, in the supposed orbit of which, as the observations accumulate, the ellipse had gradually to be increased, until in the end the most probable curve, if I may so express myself, was shown to be a straight line, or, in other words, the motion which was supposed to prove it a binary is found to be probably due to proper and not orbital motion at all. I may mention in passing, that if subsequent observation confirms this, the southern binaries referred by Mr. Doberck will be reduced to six. Before proceeding to give you so the results of my own work on our southern double stars, it may be necessary to spend a few moments in describing the instruments and methods of observation. The first instrument with which the work was begun is a very fine 7¼-inch refractor by Merz, of 10 ft. 4in. focal length, and very fine defining power ; upon this is a position circle micrometer by the same maker, with 4½ in position circle, and means of a dark and bright wire illumination, and magnifying powers up to 580. For easy stars a power of 159, and more difficult ones 330 was used ; and the method of observing was, first to place the position wire so that it bisected both stars, and then to bisect each of the stars with one of the parallel wires. After which circle and micrometer were read. Hence two independent determinations of the angle, and two readings for the distance, the difference of which gives twice the angular difference between the stars. In reducing these, the two reading of the micrometer were in some cases compared with the coincidence of wires reading to get two measures ; at other times the difference between the readings divided by 2 was taken. The result was the same whichever way it was taken. As the latter involved the smaller amount of computation, it has generally be adopted. In many cases ten readings of the micrometer were taken, that is ten measures of angle and ten measures of distance ; but in the majority of cases only six have been taken. When the stars are very close, the method of setting the wires to the apparent distance of the stars has been frequently adopted, and found more satisfactory than the other method. In a few instances the distance has been obtained by placing one of the wires between the stars, and from its known diameter and its relation to the distances of the centres, estimate the distance. The other telescope, used since 1874, is a very fine 11½-inch objective, 12½-ft focus, by Schröder, with position circle micrometer by the same maker. The illumination of wires (bright) is  obtained by four prisms placed near them, and the light from a small gas flame reflected into the side of the telescope. The magnifying powers are from 100 to 1,500, the power 800 being used for all difficult objects. The same method of observation as used with the north dome, and has been used by Mr. Hargrave in measuring Herschel’s stars and verifying the positions of new stars. About 746 of Herschel’s stars have been remeasured, some of them many times over, and 350 new double stars have been found. The results are appended, representing in this small compass some 15,000 measures of angle and distance. For the sake of completeness I have included, in the general list, a few stars mentioned in my paper read before the Society last year. With regard to other matters affecting the observations, I may mention that both domes are made of thin brass, and the temperature is very nearly always the same as inside as it is outside ; hence the work could be begun as soon as the shutters were opened. It has been my practice to observe stars on the meridian, or very near to it, and always taking the R.A. by means of the instrument, the hour circle readings show the distance from the meridian when the observations were finished. In some instances bright stars have been measured during the day-time, but generally the aperture has been reduced to get rid of excessive light of bright stars. In entering the notes at the time of observation, a diagram showing the estimated distance and angle has been made almost in every case. A few words about the list of 350 new double stars, which I cannot have the honor to present to the Society to-night. They cannot be said to be the fruits of a search for new stars, for except an evening now and then devoted to that work, and some time recently given to it at my request of Mr. Hargrave, my object has been to re-examine Sir John Herschel’s Cape list between 34° south and the pole. It would have been very easy to double the number even under these circumstances, if I had adopted the same limit of distance as Sir John Herschel ; but I was very anxious to avoid burdening the list in that way, and made my limit much smaller, and was always more anxious to record close pairs than wide ones. Nine of the new ones are under one second of arc* — several of the very difficult. Sixty-six are under five seconds, others under twenty-five seconds, and all of them are between the parallel 42° south and the pole, with one exception, which was found in the field of view with one of h.’s stars. As they are so far south  they are out of reach of northern observers, and, so far as I can learn from published lists, they are new ; but, hereafter, when the work of several double star observers in the southern hemisphere is published, it may be that some will find other lists. Many of them are very close and otherwise interesting doubles ; and there is every probability, seeing that h. overlooked them when in close proximity to star he observed, that some of them will prove to be binaries. Only a few of the have as yet be repeatedly measured, but of these several show signs of motion. One at 12h. 4m. -60° 21″ was found in April, 1873, and then the measured angle was 212.35°, in May, 1880, it was 209.55°; at first the distance was 4.33″, last year it was 3.87″, showing a change of 3° in angle and 0.46″ in distance. Another at 15 h . 50 m ., and dec - 65 ° 37 ′ in July 31, 1872, angle 134° 12′ , dist., 2.43″ ; on July 21, 1880, angle 131° 19′, distance 1.91″, again showing a change of 3° and 0.52″. Another very difficult pair at 10h. 45m., dec. −58° 38′ found in March, 1874, angle 258.81°, distance 1.15″; this one I have mentioned in the paper on double stars last year, but place it here for completeness. Another star at 13h 0m. 59.14°, found in April, 1880, gives some indication of increasing distance, which when first measured, was 0.33″, and when last seen was 0.70″. Some of h,’s stars present considerable difficulty, and are probably in motion, as for the instance 4786, γ Lupi, an easy double in 1836 is now a single star, with the highest powers on the large equatorial. The motion is evidently slow, and it is remarkable that Herschel says of this star, “Cleanly divided with power of 480 and the black division well seen, well separated with power 800” ; and of π Lupi he says, “I do not think measures of this star will be got with this instrument.” “Excessively difficult. It is closer than γ Lupi, for the discs are smaller, and yet are not so much divided.” Now I found π Lupi quite an easy object, and the mean of my measures make the distance 0.73″, while Herschel made it 0.67″, so that there has been no change in this star. But γ Lupi, which h. found so easy, I have examined a great many times and always fail to divide it even with the greatest powers on the large refractor. Another star of the same character it would seem is h. 4854, h. classes this as “very difficult to be verified.” On June 4, 1872, at the end of my evening’s work, I looked at it and divided it easily, with power 230 ; I only took one measure the angle 46° 25′, and the distance of 1.75″, being satisfied that in case, as in many others, that what was difficult in Herschel’s reflector was very easy in the Sydney refractor. By some chance I did not look at the star again until June 17, 1874, and to my surprise I could not divide it with any power. On July 16, 1880, I carefully examined it with the large telescope, and found only a round disc with all powers ; so that we have another interesting double in which the character of the motion has yet to be determined. But it would take too long to go over all the cases or real or supposed change, and I have therefore collected them into a list, giving only bare measures, more details being found in the catalogue of stars measured. In all there are twenty-two stars which give satisfactory indications of motion or have at some time been supposed to be in motion. I have added another list of seventeen interesting objects, being such double stars as have been found in the same field of view as stars which Herschel measured, and which therefore we are justified in assuming that he looked at without discovering their character. Of these no doubt some must be set down as too difficult for the reflector ; three, h. 3370, 4935, and 5078, have the large star double, but there are several instances in which the only satisfactory explanation is that the stars have changed since he looked at them. Perhaps the most striking case is 4909, where he was struck with the beauty of the group, and went on to describe it particularly, and he left out what is now one of the most striking features — a star within a pentagon, quite bright as three of the stars he mentions. His descriptions of such things are as a rule so accurate that I am convinced the additional star has  appeared since Herschel looked at the object. As another case I may mention h. 4890, which he is careful to say “is in a vacancy of the Milky Way, which here entirely of ground stars,” yet only 11s. follow 4890 ; in fact, where h. must have seen it visible, I find a beautiful double star, magnitudes 11 and 11, and in a field of 80s, diameter sixteen other stars, and the telescope (1871) used was 7½, while h. used the large reflector. There are others in the list of the same character, but I must pass on to notice changes in the magnitudes on some of the double stars. One is rather curious. In December, 1834, Herschel observed No. 3972 in his list, and called the magnitudes 8½and 8½ ; on March 7th, 1836, he looked again and called them 9½ and 11 ; next night he verified this, making them 10 and 11. In 1834, he saw a 13 magnitude star which made an obtuse and nearly isosceles triangle with the other two, and he subsequently remarks it must have been ill seen (in 1836), as evident by the magnitudes assigned, and from the fact that the 13 magnitude was invisible. When in 1873 I examined this, the magnitudes were 10½ and 12, and I could not see the little star ; it would seem therefore that they must have been brighter in 1834. The night in 1873 was not favourable, but h. 4130 was examined at the same time, and the magnitude then assigned 8-10, or the same as h.’s. There are many stars in the Cape list that cannot be found. Over some of these I have spent a good deal of time to see if they were examples of fading stars or change of position ; the result has not been satisfactory in most cases traced — they are evidently the results of clerical errors ; for instance, entering a star with the wrong R.A. or declination. Probably most of those on the list of missing stars are of this character, but some may have been overlooked from changes in magnitudes or other causes. Perhaps the (forty-six) is not surprising when we consider the difficulty of the work as carried on by Herschel. I have not given much attention to colours, nor have I carefully compared my estimates of colour with h.’s, but one or two instances have been found of apparent decided change. h. 5193 he says the larger star is “very red”; I could not see any red in it in 1873 when I remeasured it. In several cases I decided colours where h. mentions none ; these will be found in the list attached. In conclusion, I may say that my object has been to remeasure all h.’s close double stars south of 34° south declination. 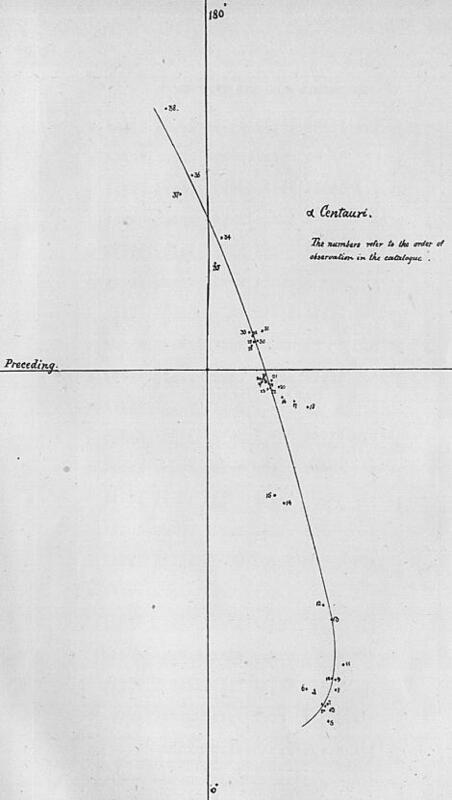 In very many cases considerable differences between h.’s observations with the reflector and mine have been found ; but a complete list of them have not been made, because the reflector observations so often differ from those h. made with his equatorial that it did not appear to be worth while. * In 2102 stars Herschel has only of 1′ and under. 3407 h’s angle 78° 30′ to 80° 51′ ; probably not in motion. 3423 h’s angle, 17° 15′ , dis. 5.78″ ; R., 0.8° dis. 5.34″. p or 6 Eridani. observations plot into a straight line as if the the notion were proper, not binary. 3930 h.’s angle 72° 43’. dis. 3.49″ ; R., 77° 5′, dis. 2.82″; probably binary. 6-12 ; H. angles. 69° 53′ & 37° 40′. 4106 h. 139° 18′ ; R. 143° 8′. 4373 h.’s angle, 226° 1′, dis. 25″ ; H., 338° 18′, dis. 12.66″. γ Centauri 16′, dis. 1.39 ″ ; motion doubtful. 4645 h.’s angle, 231° 8′; H., 202° 11′, 1881. 4691 For complete measures, see list. dis. 0.90″. h. said this is closer than γ Lupi. R., with Sydney refractor, found this an easy object, while γ Lupi is too difficult to divide ; one or the other must have changed. γ Lupi seems to be elongated, angle 270° E.; but though I have often tried I never can divide it. See note to π Lupi. from 61 ° to 76°, it is probably not binary. 5041 h.’s angle, 260° 5′, dis. 2″ ; R., 1871, 253° 35′, dis. 3.27″; R., 1873, 259° 52′, dis. 3.11″ ; H., 1880, 264° 52′, dis. 1.82″. 5027 h’s. angle, 59° 2′; R., 1871, 84° 42′; H., 1881, 91° 52′; showing change of 25° in thirty-five years, and 7° in ten years. 5084 h.’s angle, 37° 6′, dis. 1.23″; R. angle, 53° 8′, dis. 1.15 ″. 5246 h.’s angle, 216° 8′, dis. 1½″ ; R. angle, 129°, dis. 3.82″. 5258 h.’s angle, 307° 31′, dis. 3.65″; R. angle, 288° 50′ , dis. 4.68″. were then double, without seeing them. 3370 Large star, double R. No.3. In the same field with this small triangle of stars - the preceding one of which is a close double not seen by h., R. No 11. 3499 Another double, precedes this only 15s, R. No.16. 3843 Another wide double in the field north following this, not seen by h.
4645 Two pair in the field with this , R. Nos. 265 & 266. 4787 Two doubles in the field with this, R. Nos.265 & 266. 4835 Another double, 6s following this. R. Nos. 273. 4909 h. says, “This is a very symmetrical little constellation, of two large and three 12 magnitude, forming a pentagon in a direction of right angles to the two stars at its base.” On 22 July, 1872, I found a small star very conspicuous within this pentagon, and adding much to its beauty. h. would certainly have mentioned it if sen. R. 289. 4935 Large star, double, R. No. 295. 5075 h. says nearest star is distant 15′; R. finds nearest one of a pretty triangle; seems strange h. did not say so. 5078 Large star is double, R. No.317. 5256 Another double in the field with this, No. 328; and another precedes 65s and 15′north. List of 46 h. stars looked for an not found. 3530 Could not see either. 4979 Looked for several times. Instance of change in magnitude or colour. 3419 h. does not mention colour ; R. sees greenish yellow and copper red. 3962 h. calls magnitudes 8 and 10 ; R. several times 8 and ½.
them 10½ and 12 (?) variable. 3977 h. 8-9, now 9-13. 4104a h. white and blue ; R. yellow and blue. 4104b h. no colour ; R. yellow and white. any peculiarity about the star ? 4813 h. does not mention colour ; R sees yellow and blue. from 9. mag, downwards, i.e., two double and sixteen other stars. 5193 h. says large star very red ; R. cannot see red at all. Errors in the Cape Catalogue. 4030 Probably the same star. 4130 Probably the same star. 4272 R.A. 6m. too large. Should be 9h 48m. 4596 h.’s declination is 65° 7′; star is at 64° 16′. 4684 Cannot find a double here. 4836 Probably the same star. 5132 Angle of position 160° in error. 5235 Probably the same star. 5327 Angle of position 180° in error. In the Cape catalogue, Sir John Herschel used “h” as the symbol for himself. I have adopted the same letter for him in the following catalogue. R. is used for myself, and H. for Mr. Hargrave. A diagram of the positions of p Eridani is given, and another showing the Sydney observations of α Centauri, also a number of smaller ones showing interesting triple or multiple systems among those of the Cape catalogue which have been measured, and similar diagrams for some of the new ones. The value of a revolution of the screw of each of the micrometers has been carefully determined in the usual way, i.e. by separating the wires ten or more revolutions and observing transits of circumpolar stars ; that of the 11½-inch is 18.006″, and that of the 7¼-inch is 21.670″. It has been the custom always to make measures with the star as close to the meridian as possible, and the star’s hour angle at the time of observations were finished has been recorded in every case, and can be referred to if necessary. All the observations prior to July, 1874, were made with the 7½-inch, and all the observations since that date which are marked as H. have been made with the same instrument, and all those marked R. since the date given above were made with the 11½-inch. The date given in each of the catalogues is the date of the observation ; to many of the new stars the date of discovery is added. A table showing the value of the decimal date is given at the end.